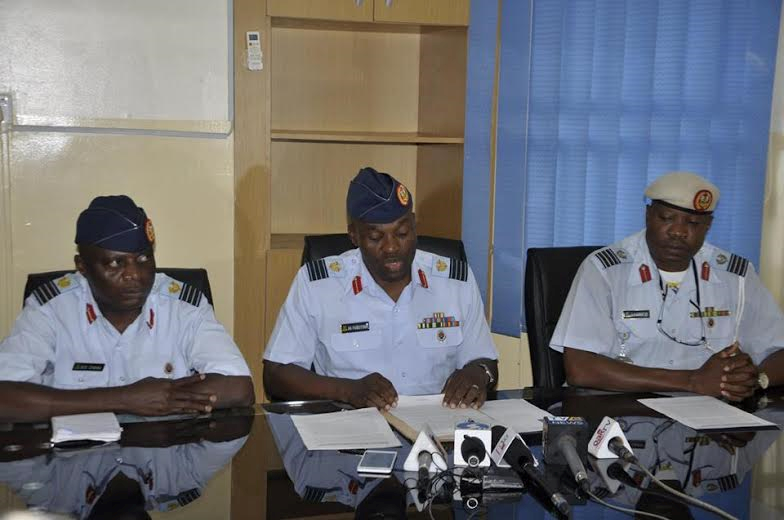 Nigerian Air Force operatives have arrested two undergraduates out to defraud unsuspecting applicants of the ongoing Nigerian Air Force (NAF) Recruitment Exercise 2016 and they were paraded today before the press in Abuja. 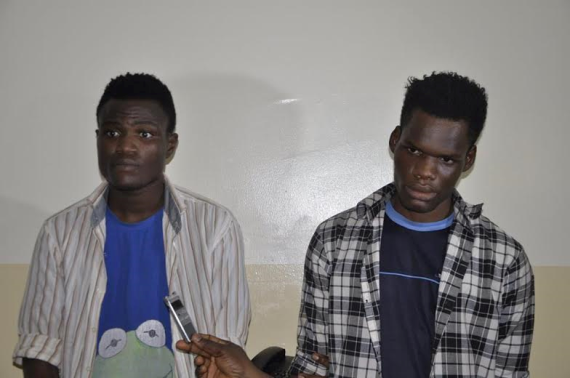 The duo, Endurance Ehichoya (Principal Suspect) and David Eghosa (Accomplice), both 21 years old and students of Ambrose Ali University, Ekpoma, were arrested in Ekpoma by NAF Intelligence operatives with the assistance of Zenith Bank officials. Their arrest followed a message posted on Facebook by Endurance Ehichoya on 25 June this year, requesting applicants to contact the Air Secretary, AVM CN Chukwu, through the GSM Number 08145038139 for enlistment assistance into the NAF. The message also contained the photograph of the Air Secretary to lure their would-be clients into believing that the scam is real. When contacted on the said phone number, Endurance had requested the caller to pay the sum of N75,000 into his Savings Account (Account No: 6231232675) with Fidelity Bank. However, the caller, wanting to retrieve as much information as possible to track down the suspect, had requested that he be provided another bank account on the ground that there is no Fidelity Bank around his area. This made Endurance to drop the details of his friend, David Eghosa’s bank account with Zenith Bank (Account No: 2111200283). 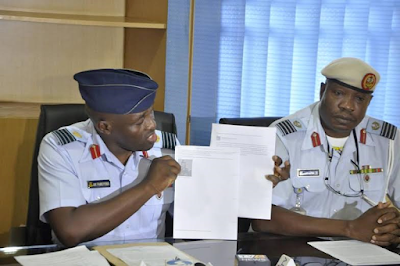 The NAF, working with the officials of Zenith Bank, then deployed his security operatives from 81 Air Maritime Group Benin to Ekpoma to arrest David Eghosa who was subsequently flown to Abuja for further investigation. Realizing that Eghosa had been arrested, his relations got the Police to arrest Endurance Ehichoya, and handed him over to the NAF. He also was flown to Abuja by the NAF for further investigation. 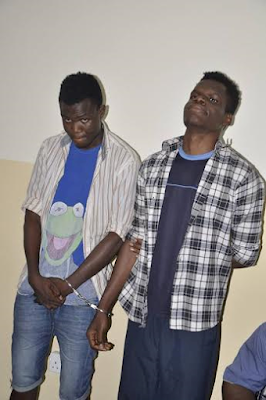 While both suspects confessed to operating multiple bank accounts, David Eghosa confirmed he knows his friend, Endurance Ehichoya, is a serial scammer, indulging in recruitment and local online dating scam using ladies’ names and photographs to defraud men online. Two of the Facebook accounts operated by Endurance to commit fraud online are Bridget Ehichoya Violet which he later renamed Ella Jonny Frosh, and Creflo A Dollar. The suspects have now been handed over to the police for further investigation. Mohammed is a Nigerian blogger of Nigeria-centric news, celebrity news, celebrity gossip and entertainment news. NaijaSilver connects you to the exposure you need. Online publicity on www.NaijaSilver.Com.Ng gets you instant exposure. Blog post or banner ad placement is a great way to spread the word about your organisation, brand, products, services, event, celebration, party, wedding, singles / album release, new music / video release, press release, celebrity feature / interview, fashion / beauty editorial and entertainment feature / interview. To advertise or for collaboration, send me a message. Be The First To Receive Our Post For Free. A very big happy marriage life to my brother who just got married.